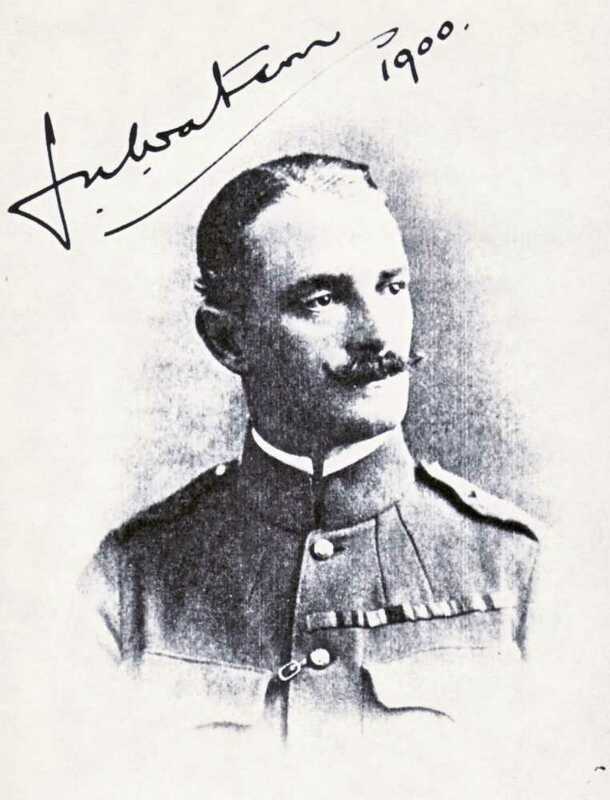 James Kiero Watson was born on 19 June 1865, son of Major-General James Watson, late 60th Rifles, and Mrs. James Watson. He was educated at Clifton College and RMC Sandhurst, and was gazetted to the King's Royal Rifle Corps on 25 April 1885. In 1891 and 1892 he served in Burma, taking part in the operations in the Chin Hills. He was attached to the Egyptian Army in 1894 and posted to the Xth Sudanese Regiment. He was the first Englishmen to meet Slatin Pasha after his escape from captivity at Omdurman. In 1895 he became ADC to Lord Kitchener, a post he held until 1905, and held a close relationship with the Earl until his death in 1916. He served in the Expedition to Dongola in 1896 as ADC to the Sirdar, being present at the operations at Firket on 7 June and Hafir on 19 September. He was mentioned in despatches, received the Egyptian medal with clasp, and was created a Companion of the Distinguished Service Order: ‘James Kiero Watson, Captain, King's Royal Rifle Corps. In recognition of services during the recent operations in the Sudan’. He served in the Nile Expedition, 1897, was awarded the 4th Class Medjidie, and received a clasp to the Egyptian Medal. He was again ADC to the G.O.C. in the Nile Expedition of 1898, and was present at the battles of the Atbara and Khartoum, and was given the Brevet of Major 16 November 1898. After Omdurman he was appointed to the coveted post of Military Secretary in Cairo, trying to restore order to an office disrupted by three years of warfare. However, he was soon back in action, serving with the White Nile Expedition of 1899, taking part in the operations which resulted in the final defeat of the Khalifa at Gedid (Um Debaykarat), as DAAG, Flying Column. He received the 4th Class Osmanieh and (2) to the Egyptian Medal. Watson served in the South African War as ADC to Lord Kitchener, 1899-1901, and was present at the RoK. Also in the operations in the OFS, February to May 1900, being present at Cronje’s surrender at Paardeburg (17 to 26 February). Operations in the Tr in May and June 1900, including actions near Joh and Pretoria. Operations in the Tr, east and west of Pretoria, July to 29 November 1900. Operations in Orange River Colony, May to 29 November 1900. Operations in CC, south of Orange River, 1899-1900. Operations in the Tr and CC, December 1900 to April 1901. Operations in Orange River Colony 30 November to December 1900. He was present at the capture of Pretoria on 4 June 1900 and was created a CMG. In 1901 Captain Watson returned to Egypt as AAG to become Military Secretary once again, but was appointed ADC at Headquarters by General Wingate, a post he held until 1905. He was promoted Major in October 1902. He accepted the Khedive’s invitation to become his ADC, and resigned his commission on 3 May 1905 to become an officer in the Egyptian Civil Service. It was a difficult position to hold in the Khedival Court but Watson soon earned the complete trust of the Khedive. He was created a CVO in 1912 for his services. The Khedive chose to remain in Europe during the Great War, thus releasing Watson to be recalled and join the British forces in France as DAAG, 1914-15, as Railway Transport Officer. He was next Commandant, Advanced Base, Cape Helles, Gallipoli, in 1915, until he fell sick and was hospitalised. Watson returned to Cairo where he became British Military attache from 1916 to 1920. He was awarded the Legion of Honour (France), Order of the Sword (Sweden), Order of Leopold (Belgium), Order of the Crown (Romania) and created a CBE in 1919. Having time on his hands in 1920, he returned to the Sudan, before finally retiring in 1922. He was appointed Equerry to the Duke of Connaught in 1939. Lieutenant-Colonel Watson died on I3 January 1942. The medals to the father of actor Christopher Lee. 'My father was a tremendous natural athlete. At Radley Public School, at the Royal Military Academy of Sandhurst, in the Army and around and about he garnered a massive pile of cups and trophies. He was a champion at squash, fives, racquets, court tennis, epee, foil and sabre - and bayonet!' Sir Christopher Lee's Lord of Misrule, refers. Geoffrey Trollope Lee was born in London on 29 October 1879, the son of Ellis and Constance Helen Trollope Lee. Educated at Radley and the R.M.C. Sandhurst, he was commissioned in the King's Royal Rifle Corps (K.R.R.C.) and first saw action in the Boer War. 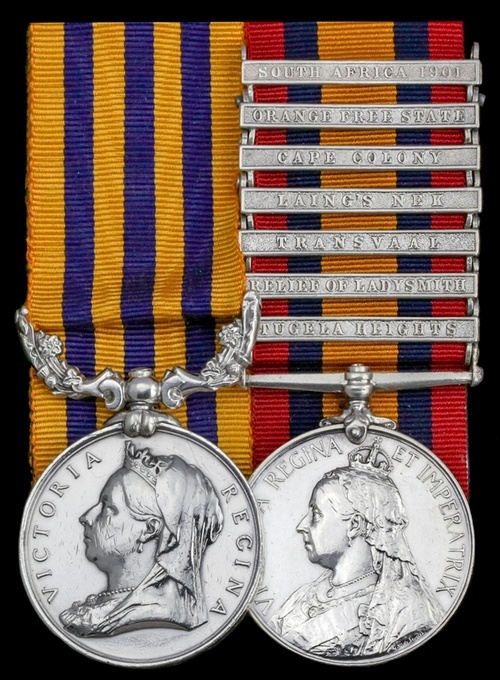 Assigned to the Mounted Infantry with an appointment as a Lieutenant in the 4th Battalion, K.R.R.C., he saw action in the Transvaal and was severely wounded at Jackalsdam on 4 September 1901 (Queen's Medal & 3 clasps). In 1910, Lee married Estelle Marie Carandini di Sarzano, 'a classic beauty' who sat for such artists as Oswald Birley and Lavery. 'The batman was called Smith. As if this were not anonymous enough, he was never granted any other name when the family spoke of him. Yet he and my father were deeply attached to one another through the deepest mire of the stalemate in France. He was a lean, wiry individual with a high polish on his complexion from constant exposure to sun and sand. As an Australian he was naturally no respecter of persons. It happened that Smith was delegated by fate to be minding of his own business where my father was bound to trip over him when he strode into the Australian camp near Mina, in Egypt, to take up his new command. My father's majority was newly gazetted and he was the first British officer to be given the somewhat volatile assignment of readying for battle a batch of Australian soldiers regarded as a rabble by the War Office but whom a prudent person would recognize as an assembly of extremely rough, tough private citizens in uniform. He arrived to find nothing but a lot of tents in a sea of sand, with the Pyramids propping up the canopy of heaven and no humans visible anywhere. He identified a large tent as the Orderly Room, but there was nobody in that either to welcome or challenge him. He moved on to the next tent, which was making a half-hearted attempt to be an office. The effect of chairs and tables and in-trays and out-trays was spoilt, however, by the office's sole occupant, a man squatting on his hunkers wearing only socks and shorts while languidly caressing a pair of boots with a strip of wadding. He did not look up. 'Where's the Orderly Room N.C.O.?' asked my father. The trooper turned the boot around on his hand, and proceeded on his slow way with the cloth. 'I'm the new commanding officer,' my father remarked. The Australian did look up for a moment, but only to return with greater concentration to his previous interest. My father made one of those swift transitions from civility and amiability to explosive rage which seem to be characteristic of all members of the family. 'Hot, ain't it?' said Smith compassionately. Luckily this appealed to my father and it was the beginning of a durable association. Maybe it was lucky too for Smith that he had this confrontation and was elected to the vacant position of personal slave because the confrontation with the unit as a whole was a fearsome grind. The new commander had been schooled all his life to believe that discipline and unquestioning obedience were the keys to victory. He meant to have it from his hybrid 'imperial' force. To get it he often pegged men out on the sand during the heat of day. One trooper who objected to this treatment assaulted him with a bayonet. My father knocked him out and put him on a charge. It's not easy to imagine oneself back into the skins of warriors of another age, but perhaps it's not sentimental to think that this fellow would also have been ready to fill the position of batman, if it had not already been taken. In December 1916, Lee took command of the 16th Battalion, K.R.R.C., in which capacity he remained on active service in France until June 1917. 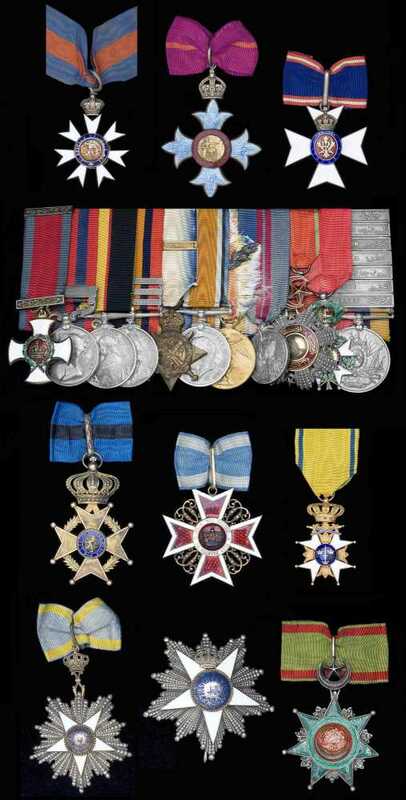 In addition to his award of the French Croix de Guerre, he was twice mentioned in despatches (London Gazettes 21 April 1916 and 4 January 1919, refer) and awarded the Egyptian Order of the Nile. Sadly, however, as Sir Christopher Lee would recall in Lord of Misrule, his parents divorced when he aged six years. The Colonel died in London on 12 March 1941. Royal Military College Sandhurst, R.M.C. v R.M.A. Racquets Medal, 1899, named 'G. T. Lee', silver, 70mm. Woolwich and Sandhurst Athletics Medals (2), for Cricket, 1899, named 'G. T. Lee (Capt. )', silver, 50mm. ; another similar, for Association Football, 1898, named 'G. T. Lee' bronze, 50mm. Army Athletics Club, Public Schools Fencing Competition Medals (3), for Sabre v. Sabre 1897, 1st Prize; for Sabre v. Sabre 1898, 1st Prize, and for Foil v Foil 1898, 1st Prize, all three named to 'G. T. Lee, Radley College', silver, 45mm. Lord Roberts Challenge Cup for Young Soldiers, inscribed to the '4th King's Royal Rifles', silver, 30mm. R.W.G.C. Handicap Challenge Bowl, named to 'Capt. G. T. Lee, 1914', silver, 23mm. The group to Christopher Lee’s father sold for a hammer price of £2,200 yesterday. Mentioned In Despatches 22/6/1915, 11/12/1917, 20/5/1918, 20/12/1918. French Croix de Guerre L/G 10 Oct 1918. Served 1st KRRC, 56 Infy Bde, and 6th Infy Bde during WW1. Lived Manor House, Burley, Brockenhurst, Hants. William Spencer was in Derby, Derbyshire in December 1870 and enlisted in the King's Royal Rifle Corps in August 1891, aged 20 years. He was posted to the 3rd Battalion and served on the Isle of Wight until enlisted in a special Mounted Infantry Force destined for Rhodesia in April 1896 - he was one of 29 men selected from the ranks of his battalion. He subsequently saw action with the Mashonaland Field Force (Medal) and returned to England in June 1897, when he was placed on the Army Reserve. Recalled on the advent of hostilities in South Africa, Spencer was drafted to the 3rd Battalion, K.R.R.C. and arrived at Cape Town in November 1899. He was once again selected for duties in the Mounted Infantry, as part of 4th Brigade Mounted Infantry Company; he would later serve in Gough's Mounted Infantry. 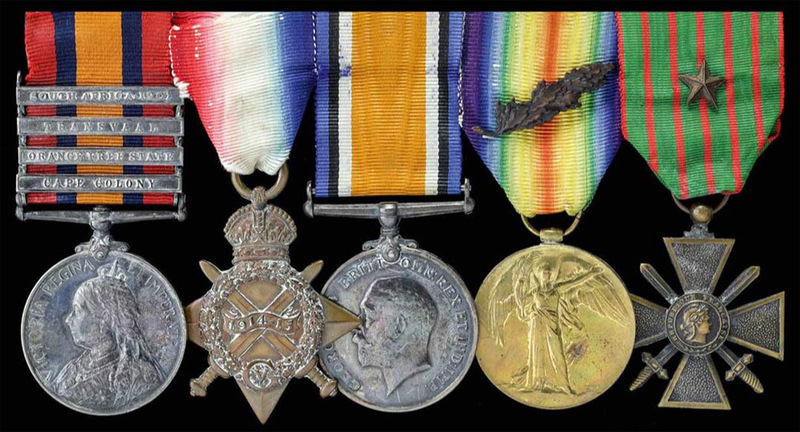 As such, he was heavily engaged in the relief of Ladysmith operations and beyond (Queen's Medal & 7 clasps). He was discharged in May 1902 and died at Spondon, Derbyshire in April 1939. William James Humerston was born in 1855 at Widmore Street, Bromley, Kent, serving with the 60th Rifles as Sergeant Instructor of Musketry from 1875. He was discharged at Mallow, County Cork on 18 April 1902 and died in 1903. I have not checked but I wonder if this is his complete entitlement?